With greenhouse gas emissions climbing and climate impacts becoming increasingly severe, the urgency to address climate change has never been greater. Many of the solutions to date have focused on mitigation—ways to slash emissions as quickly as possible, such as by adopting renewable energy, promoting energy efficiency and stopping deforestation. These efforts remain critically important, and we need to accelerate them. Yet the science shows they will not be enough on their own to have a good chance of meeting the goals of the Paris Agreement on climate change. To prevent the worst impacts of climate change, the world will need to reach net-negative emissions, a point at which we’re actually removing and storing more carbon from the air than we’re putting into the atmosphere. This will involve deploying techniques that remove carbon from the atmosphere and permanently store it. Carbon-removal strategies remove carbon dioxide from the atmosphere and store it through various means, such as in soils, trees, underground reservoirs, rocks, the ocean and even products like concrete and carbon fiber. The different natural and technological approaches to carbon removal come with very different risks and benefits. WRI has published a series of working papers, entitled CarbonShot: Creating Options for Carbon Removal at Scale in the United States, which explores the challenges and opportunities to using carbon removal to help combat climate change and offers practical steps U.S. policymakers can consider to spur action. Two papers in the series explore the many ways to remove carbon from the air, from restoring forests and changing farming practices to using technologies like direct air capture with storage or biochar. A third paper serves as a primer on the big questions surrounding carbon removal, such as its role in efforts to stabilize temperature rise, whether carbon removal can be pursued safely and prudently, and how it fits with efforts to curb emissions. Experts from across WRI’s Climate, Energy, and Natural Infrastructure teams are continuing to conduct research exploring how carbon removal strategies can help address climate change. Note: This is a notional scenario consistent with an at least 66 percent chance of limiting global warming to below 2°C. Some residual gross greenhouse gas emissions (both CO2 and non-CO2) will remain at the end of the century even with ambitious climate action because they are too difficult or costly to remove entirely. Once negative emissions exceed those that remain net zero emissions is reached. 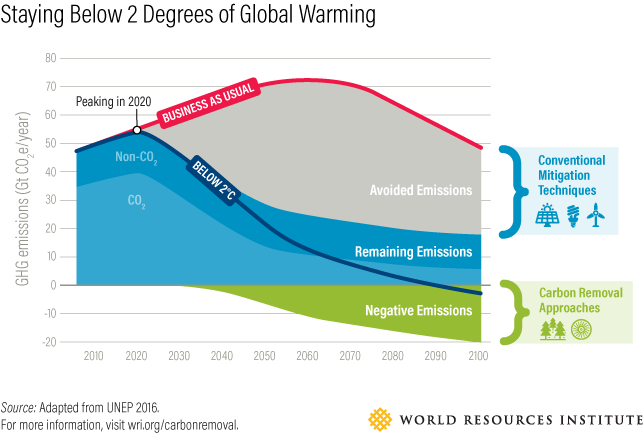 Faster and/or deeper emission reductions could reduce the role for carbon removal; slower and/or weaker emission reductions would increase the need for carbon removal.